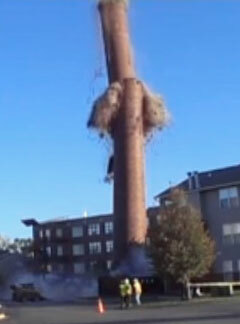 VRHabilis was hired to remove the deteriorating smokestack from the old Ovaltine plant which no longer exists. The demolition was performed by using Precision Blasting. Due to the proximity of surrounding condominiums, toppling the smokestack was out of the question. Charges were timed to blast precisely which allowed the smokestack to drop vertically.